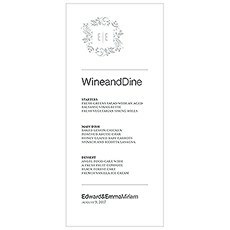 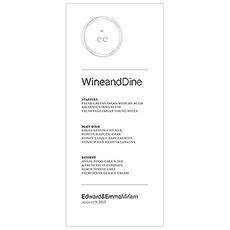 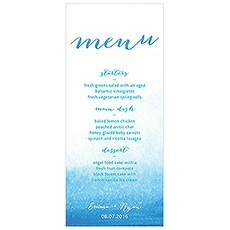 Everyone will know what’s for dinner with this selection of personalized menu cards available in many styles and colours that will look just right on the tables. 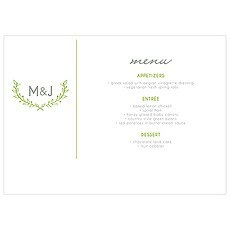 Weddingstar makes it easy for you to add special details to your wedding reception that will make your event even more special. 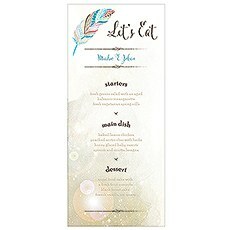 Create one-of-a-kind DIY wedding menu cards with our selection of available menu templates. 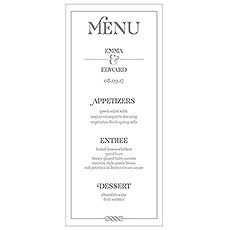 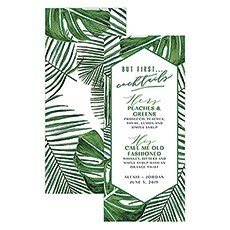 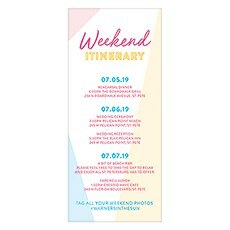 Customize your own reception menu card for a thoughtful, practical detail that is guaranteed to add a special finishing touch to your fab festivities!These customizable wedding menu cards are an economical way for you to add details to your wedding reception that will impress your guests. 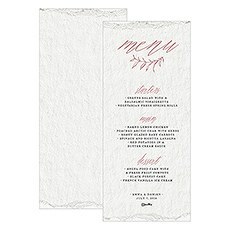 Choose from many different styles and colours - it's easy to find the ideal wedding reception menu card that will add the finishing touch to your tabletop decor.Set one of these stylish menu cards at each place setting or display them at each table to satisfy your guests' curiosity. 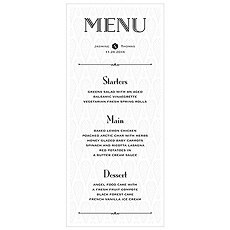 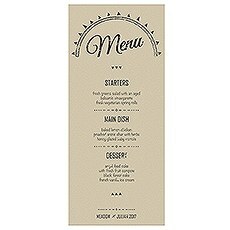 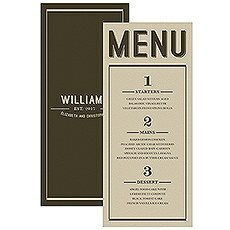 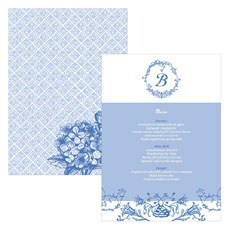 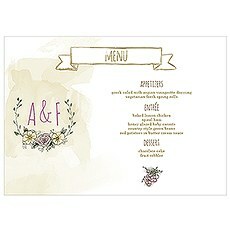 Our wedding reception menu card designs range from ornate and classic to simple and straightforward. 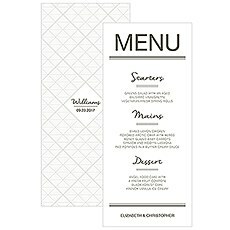 Choose our Classic Script menu card or a range of designs in our Monogram Simplicity menu cards that display your monogram in creatively beautiful designs that are elegant, modern, botanical and classic - choose our Monogram Simplicity style card with an open area if you choose a DIY project, and emboss or stamp your menu card yourself.Romantic vibes will abound with our Vintage Romance large menu card style or our Modern Fairy Tale Menu Cards. 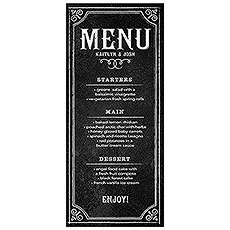 Capture the vibe of a city bistro with the Bistro Bliss menu card or opt for a menu card with chalkboard print - available in five colours.From whimsical and dreamy to classic or opulent, our menu cards have something to offer everyone. 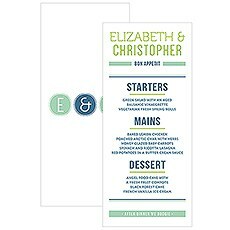 Choose the style that best reflects your venue and style.Our attentive design details are super easy to achieve and are available at fantastic prices. 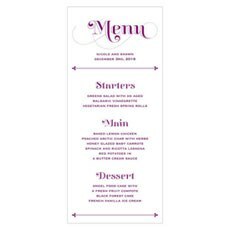 You will love how you can have your wedding cake and eat it too - our DIY wedding menu cards will give you the attention to detail you desire while still remaining in your budget!